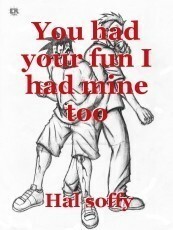 You had your fun, I had mine too..
Hey man..you bully. You so happy being a bully? Put smirks on your face like crazy? You walked arrogantly. You're proud of what you are...really.You're the lion king..you're telling me? But no..not to me.You're Mr Nobody. With my one eye I won't see. You play dirty. Same with me. You're nothing to me.Just another bully. As filthy as can be.Yes you are.... mr bully.And now you don't look scary. Woh..you said. You said I'm dead.There are dues to be paid.Yes that's what you said. No more will I be playing dead. This time you'll be dead. It's you instead. I'll be mean as I said. You better hide under the bed . You had your fun. You lost your gun. No more laughter in the sun. Cause you have to run. Hide yourself underground. I'm coming around .You tell someone. You have had your fun. I had mine too..pardon the pun.